, a celebrated scholar and critic, professor of politics and history at Leyden, and librarian of the university there, was born at Ghent, in Flanders, May 1SO, of an illustrious family, who had possessed the first places in the magistracy of that town. He was frequently removed in the younger part of his life. He began his studies at the Hague, and afterwards went with his parents into Zealand, where he was instructed in polite literature and philosophy. He soon learned the outlines of morality and politics, but did not relish logic, and had an unconquerable aversion to the niceties of grammar. He discovered early a strong propensity to poetry, and began to make verses before he knew any thing of prosody or the rules of art. 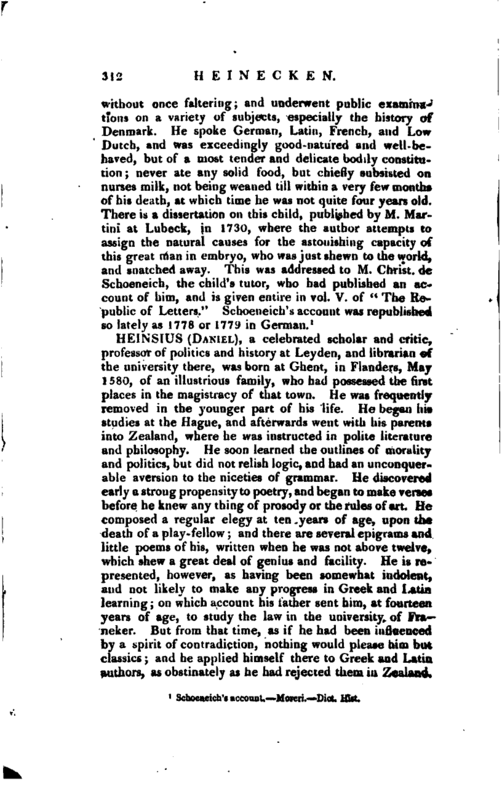 He composed a regular elegy at ten years of age, upon the death of a play-fellow; and there are several epigrams and little poems of his, written when he was not above twelve, which shew a great deal of genius and facility. He is represented, however, as having been somewhat indolent, and not likely to make any progress in Greek Und Latin learning; on which account his father sent him, at fourteen years of age, to study the law in the university of Franeker. But from that time, as if he had been influenced by a spirit of contradK*:on, nothing would please him but classics; and he applies inmself there to Greek and Latin authors, as obstinately as he had rejected them in Zealand. | He afterwards removed to Leyden, where he became a pupil of Joseph Scaliger; and was obliged to the encouragement and care of that great man for the perfection to which he afterwards arrived in literature, and which at the beginning of his life there was so little reason to expect. 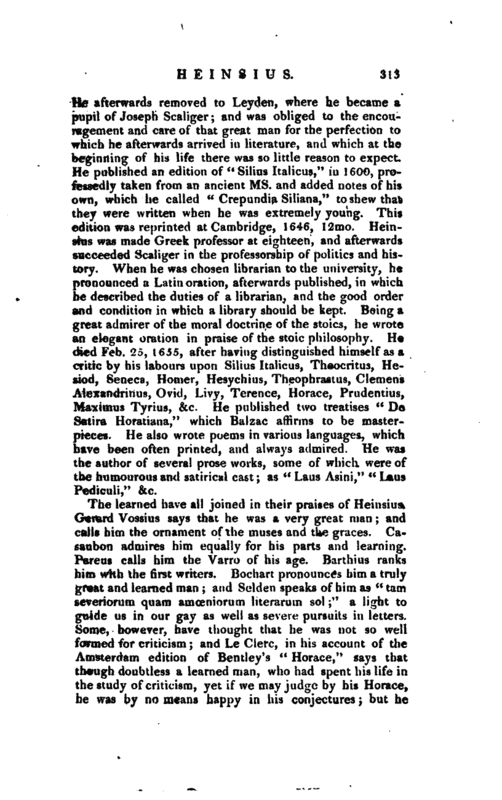 He published an edition of “Silius Italicus,” in 1600, professedly taken from an ancient ms. and added notes of his own, which he called “Crepundia Siliana,” to shew that they were written when he was extremely young. This edition was reprinted at Cambridge, 1646, 12mo. Heinsius was made Greek professor at eighteen, and afterwards succeeded Scaliger in the professorship of politics and history. When he was chosen librarian to the university, he pronounced a Latin oration, afterwards published, in which he described the duties of a librarian, and the good order and condition in which a library should be kept. Being a great admirer of the moral doctrine of the stoics, he wrote an elegant oration in praise of the stoic philosophy. 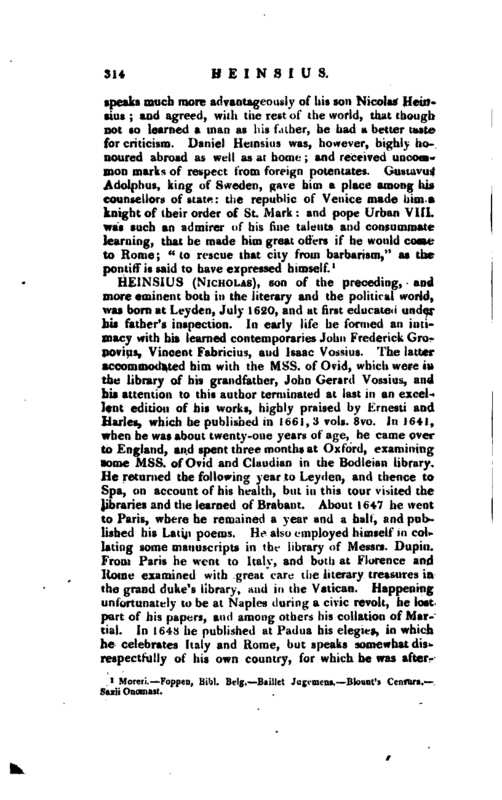 He died Feb. 25, 1655, after having distinguished himself as a critic by his labours upon Silius Italicus, Theocritus, Hesiod, Seneca, Homer, Hesychius, Theophrastus, Clemens Alexandrinus, Ovid, Livy, Terence, Horace, Prudentius, Maximus Tyrius, &c. He published two treatises “De Satira Horatiana,” which Balzac affirms to be masterpieces. He also wrote poems in various languages, which, have been often printed, and always admired. He was the author of several prose works, some of which were of the humourous and satirical cast; as “Laus Asini,” “Laus Pediculi,” &c.
Moreri. —Foppen, Bibl. Belg, Baillet Jugemens, Blotmt’s Censtra. —Saxii Onomast.